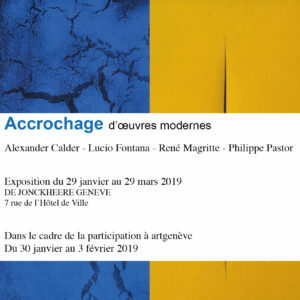 De Jonckheere presents an exhibition of modern works in its gallery, on the itinerary of the old town « Parcours Sculpture » of artgeneve fair (30 January – 3 February 2019). Pieces by Alexander Calder, Lucio Fontana, René Magritte and Philippe Pastor will be showcased on this occasion. Philippe Pastor presents his new paintings of the « Blue Monochrome » , dedicated to the sea, where the use of natural pigment of the Moroccan Mount Atlas gives them a particular intensity.